This is a delightful way to begin or end your Valentines celebration. It is served to wine tasters at the Wilson Creek Winery in Temecula and greeted with great delight. You may purchase it just about anywhere they sell sparkling champagne. Just fill a chocolate cup with Almond Sparkling Wine and there you have it! Yummm! You could also fill cups with Strawberry, Raspberry or any other Sparkling wine depending on your preferences. Whatever you do...Make It Delightful! 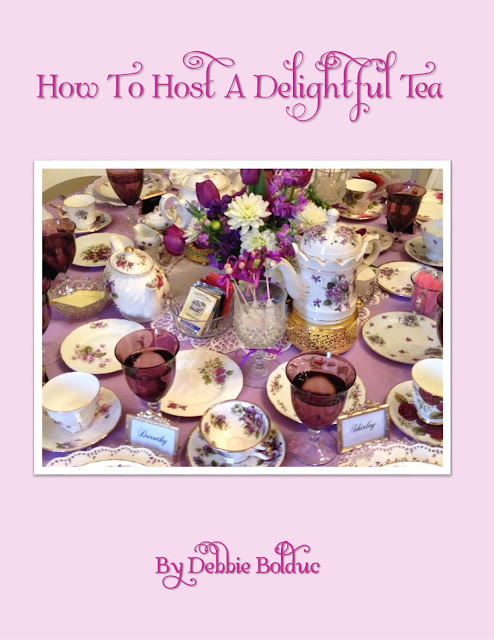 New Book "How To Host A Delightful Tea"
Writing and publishing a book has always been a dream of mine. Forever on my bucket list, something I can now cross off! However, I must say, publishing a book is like having a baby. I immediately want to write another one. I still have ideas rolling around in my noggin. I self-published this book and am so proud of it. I know it isn't the caliber of Martha Stewart, although in some ways it is even better. It is super special to me because it includes Teas I have hosted and ideas that I want to share to make anyone who desires to host a Tea have a great experience. It's full of instructions on hosting an event that is above average. I believe it takes just a bit more effort to take something from average to above average. In my case, I wanted it to include the word "Delightful" in the title. because it is always my goal to make any event I host delightful for my guests, and for me! I created it in a spiral format because I want people to use it. Fold it back, copy a list from it, or a recipe when needed. I tried to price it fairly as books are not inexpensive to publish, especially in color with lots of photographs. I chose to design it that way because I'm very visual so I must have pictures to give me the inspiration I need. This is a first for selling an item on my blog. I don't inundate you with ads. It's available to you if you wish to buy one, or ten ;-). Just click here. Thanks for your continued viewing and support. I'm so very grateful for each of you. I had to laugh as I started to write this blog post as my husband and I never stay up until midnight much anymore. So I wasn't about to name this post "New Years Eve Tablescape". Because there are such positive messages on the plates I used, I decided I would use them all month and remain in the mood of great beginnings. These plates cheer me up just looking at them and I love seeing and using them daily. These flowers have stayed really fresh for over two weeks! They were a real bargain at Trader Joe's. I wish you all of these sentiments and all the Lord's blessings upon you in the new year. Below is a fun activity you can feature at your dinner to stimulate conversations and get to know your guests even better. 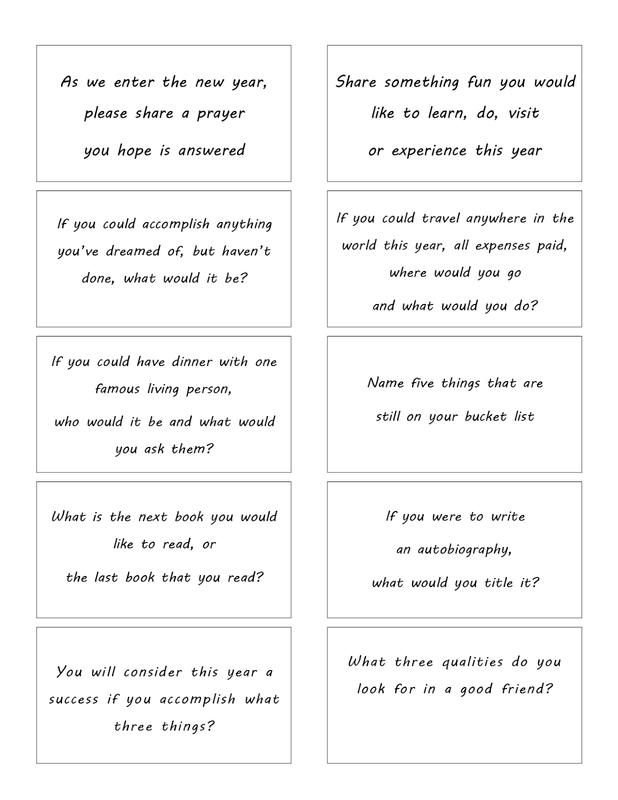 Print these, cut them out, and place one under each guests charger or dinner plate and reveal when ready to use. You should be able to click on the document and print it.